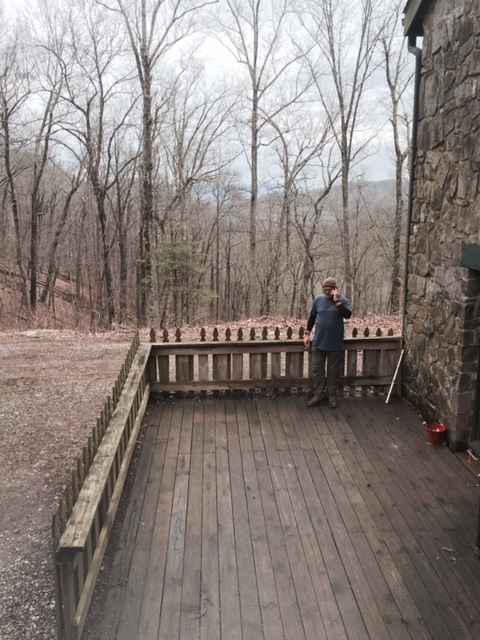 We are in the midst of full blown hiker season here at Mountain Crossings. It’s a fun and crazy time of year! Hikers everywhere. Gear strewn all about. Food being consumed in unbelievable amounts. It’s excellent! 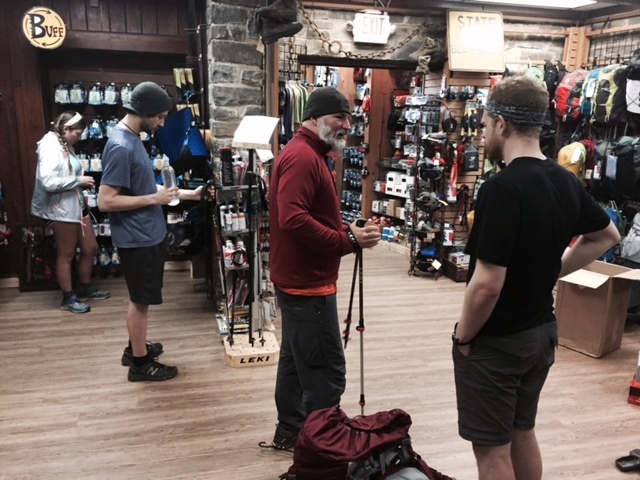 Here is a little photo essay of a typical day at Mountain Crossings during peak thru hiker season. Jason manning the register behind desk. If you don’t watch out you can get stuck back there for quite a while on a busy day. The upside is that you have control of the music! Our pal Irish is hanging out for a few days helping out in the shop. 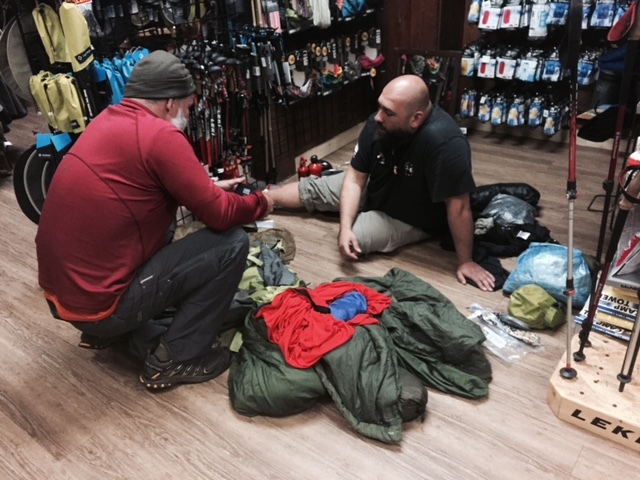 Here he is giving the run down on the proper use of trekking poles. Not only can poles change your hiking game, how you use then can changes everything as well! New product is constantly flowing in throughout the season. 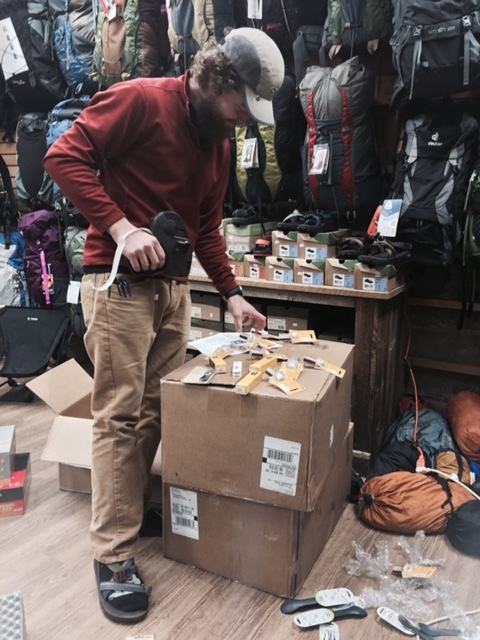 With so many thru hikers coming through, it is a never ending battle to keep the shelves stocked! Pretzel is busy getting a shipment out on the shelves. Pack shake downs are a huge part of our day. During peak season we do several every day. It is a free service and we will never pressure a hiker into it, but many come in asking for tip to lighten their load a bit. We are always happy to help out! So many food options for a starving hiker! It can be overwhelming. We have hot foods that can be made immediately and we also have an extensive collection of hiker favorites for resupplying. Man, do we love pizzas! 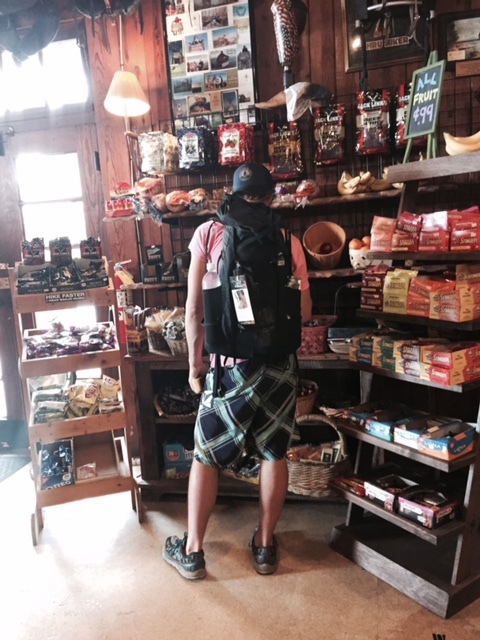 This hiker went straight for the good stuff for lunch before hitting the trail again. We have two little ovens in the back of the shop for cooking pizzas. Sometimes you’d think you’re walking into a pizzaria instead of a gear shop because of the wonderful smell of pizza! The picnic table is a big gathering area for hikers. They cook here, repack their bags or just sit around and hang out. Here are some hikers soaking up some of Baltimore Jack’s trail wisdom. Mountain Crossings is a excellent place to phone home and let everyone know you’re doing well. Do your family a favor and keep them updated! You may be having a blast out here but its only fair to check in when you’re in town or at a hostel. 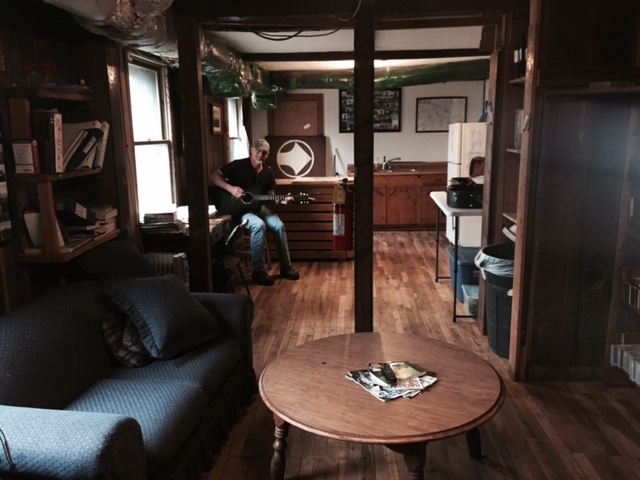 Here is Splitter getting some guitar practice in before the hostel fills up for the night. By 5 o’clock there are usually tons of hikers watching movies, playing board games, or making dinner. Things can get crazy in the hostel when all the hikers start flowing in. 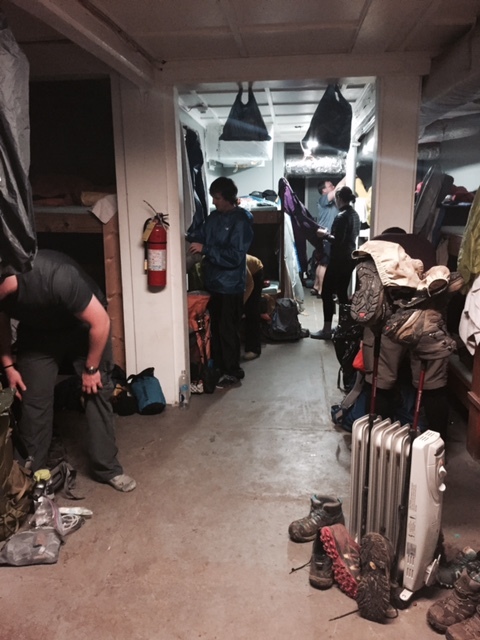 Everyone is trying to get settled in and get their gear dried out for the next stretch. It is always a good time talking and sharing stories with everyone. 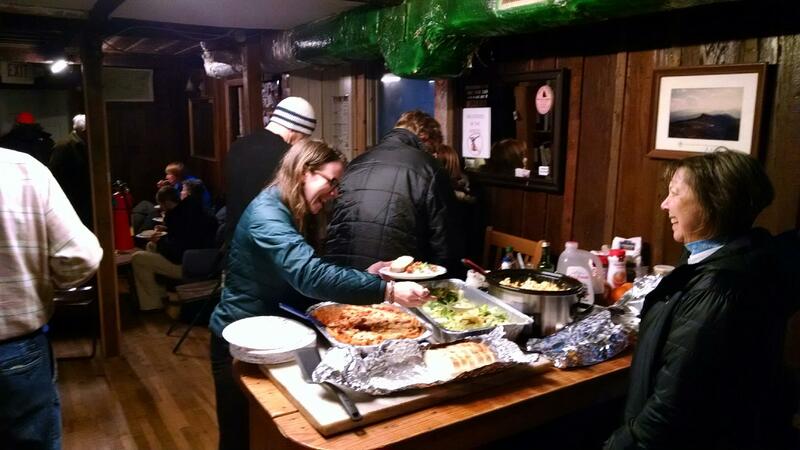 There are a lot of awesome folks in our community around Balirsvillve, GA. During peak season there are many groups who come in and set up a little hiker feed in the hostel. A nice, hot, home cooked meal has never been as good after a couple days of hiking! Hikers, hikers everywhere! On the porch. In the breezeway. In the hostel. Outside of the bathrooms. There is no such thing as boredom around here. This entry was tagged appalachian Trail, Blood Mountain, mountain crossings, thru hiking. Bookmark the permalink. Never a dull moment. Thanks for sharing.